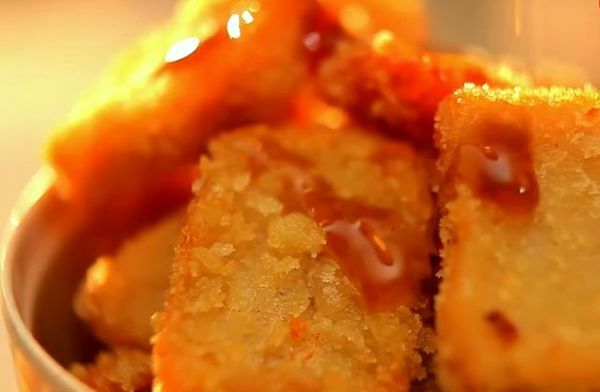 Aside from making fish ball and fish burger, fish nugget is another value added product and a good business idea to learn in food processing business to make an added income for the family. Below is the fish nugget recipe. Grind fish meat in the silent cutter. Add salt, onions, and the chopped garlic. Continue grinding. Add the rest of the ingredients: nutmeg, white sugar, and cinnamon, wheat flour. Grind thoroughly while gradually adding water. Water is used to loosen the mix. Add the vegetable oil. Lastly, add the shrimp meat. Grind until homogenized mixture is attained. Mold mixture in a rectangular shape. You can used a customized rectangular molder. Dip nuggets in a commercially prepared batter mix. The ratio should be 1:1 batter mix and cold water. Put in polyethylene bags and seal. Deep fry until golden brown then serve with your choice of sauce. 1. In a mixing bowl, combine the flour, cornstarch, and baking powder, and salt. 2. In a separate mixing bowl, combine 1/2 cup plus 1 T. water, 1 T. beaten egg, and oil. 3. Add wet ingredients to dry and combine until mixed.